This was a delicious and hearty casserole that took very little effort and about 20 minutes to make. I sliced 1 piece of linguiça sausage (about 6 oz.) into 1/4 inch pieces. Then I chopped up 1/4 of a yellow onion. I tossed them together into a medium low sauté pan, since the linquiça has plenty of fat for the dish without any additional oil. I then chopped up 2 cups of cauliflower and added the cauliflower, and some salt and pepper, to sauté for a bit. Meanwhile, I cleaned 5 pieces of kale, removing the stems. I rolled the kale up and sliced in ribbons and then did a quick chop cross-wise of the ribbons. This made about 4 cups of kale. Kale cooks down a lot, so when cooking you always want to add more than you think you want. I added the kale, another bit of salt and pepper to the pan. While that cooked, I quartered grape tomatoes – until I had 1 cup of them. When the kale was about half done, I added 2 TBSP of red wine vinegar and the tomatoes and let cook for about 4 more minutes. The vinegar is critical to elevating the flavors. It helps the flavors blend. 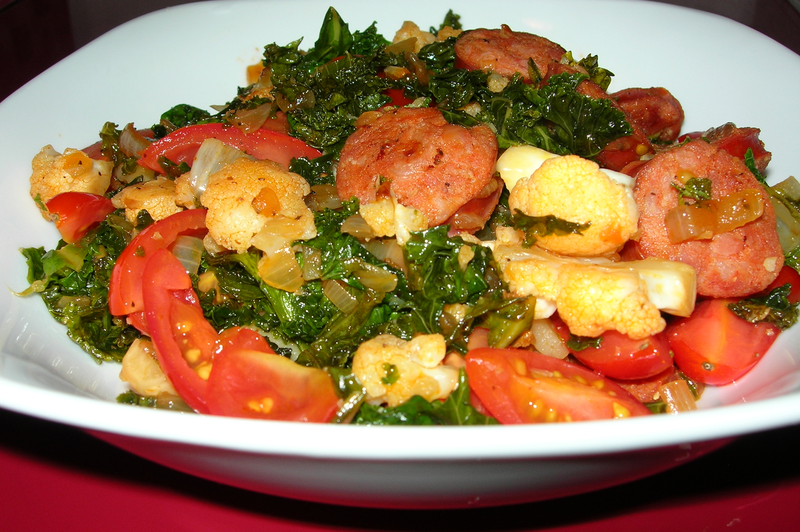 The linguiça is spicy and adds rich flavor to the vegetables. This made 4 servings of delicious casserole. This makes a lot more than one serving, but generally I like making a good size batch of soup and reheat for a few meals. In a medium sauce pan, add 1 onion chopped, 1 diced serrano pepper to a 2 tablespoons of olive oil and cook until softened. Add salt and pepper. Meanwhile chop up a whole cauliflower and toss in the pan and cover with water. Toss in a bay leaf and bring to a boil. Reduce to a simmer and cook until tender. Remove from the heat and let cool. After it’s cooled, puree and put back on the heat, adding a small package of frozen corn, salt and pepper and some parsley. This has the consistency and look of a chowder but has a much bright, fresh flavor that blends well with the heat from the serrano. If you don’t want it vegan, adding sour cream as a garnish or into the puree would give you a slightly more mellow taste. First I cleaned and cut up some vegetables to roast, making sure to keep the size fairly uniform. I used one sprig of broccoli, one large floret of cauliflower, about 6 fingerling potatoes, a small onion and three cloves of garlic. I tossed them with 1 TBSP of garlic and a teaspoon of kosher salt. I put them all in my paella pan in the oven at 450° to roast until done – about 25 minutes. As always, roasting vegetable until they begin to blacken and caramelize gives you the most delicious umami flavor that makes you feel so well-fed and satisfied. Meanwhile, I julienned one parsnip and chopped about 1 TBSP of fresh ginger. I juiced one fresh lemon and put all the juice in a saucepan with the ginger and parsnip and let it simmer, braising the parsnip until done. I added just enough water to keep the parsnips cooking without charring. When the parsnips are nearly done (about 15 minutes) add 1 tsp on sugar and stir in well. This makes 2 servings, so set half aside for tomorrow. The parsnips will have a just shy of pucker sour, sharp lemony brightness with some extra bite from the ginger. Serve with caution as they can become addictive. In a small pan, I put 1/4 cup of white wine on to simmer with two frozen 4 oz. fillets of Alaskan Cod or Torsk. I added a few peppercorns (around 6-8) and about a teaspoon of dry mustard and 2 tsp of dried tarragon. I poached the torsk in the wine, turning to cook on both sides. The fish is done as soon as it turns to opaque in the center and will be tender and flakey. This takes about 10 minutes or so. I took 8 green olives, cut them in half and tossed in just before serving. I removed the cod and plated it, adding a dash of dill weed. I added 1 tsp of flour to the poaching wine and stirred in well to thicken the sauce just a bit before spooning it on the fish. This has a subtle and delicate flavor of wine and olive, but not so strong that it overwhelms the fish. I put the fish on the plate, spooned the sauce over it. On the other side of the plate I put half the parsnips. I pulled the roast vegetables out and placed them in the center. Both side dishes are vegan and very tasty. 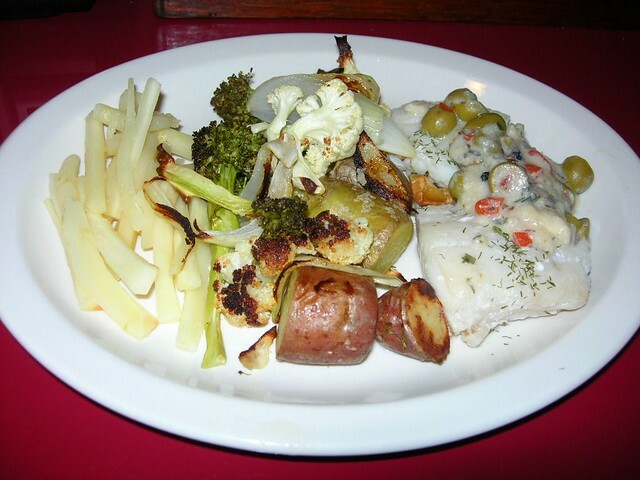 The flavor contrasts with the bright, sharp parsnips, the savory veggies and the delicate fish were immensely satisfying. 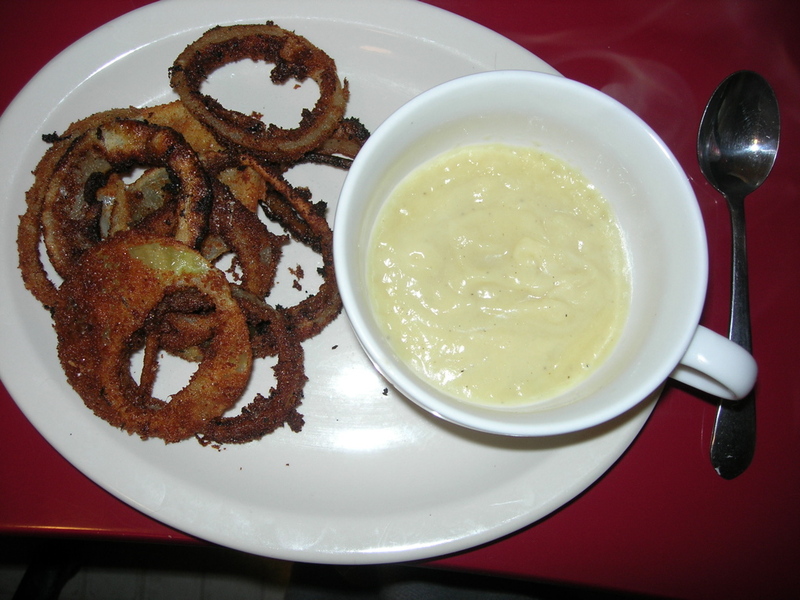 I reheated yesterday’s cauliflower soup and ate it with some home-made onion rings. Heat about 1/2 inch of oil in a sauce pan for deep-frying. Cut peeled onion into three slices about 1/3 inch thick or so. Mix some salt into the flour in a flat bowl. Whip up the egg with water in the second flat bowl. In the third stir some herbs or spices into the bread crumbs. Be guided by your own taste preferences and mood. This time I used Jamaican Jerk spice blend. Break into rings and store the smaller rings in a baggie for another meal. Using the outer rings, dip first in the flour, then the egg and then the bread crumbs and drop into fryer. You can fry about 4-5 rings at a time. Remove from heat and place on paper napkins to absorb grease drippings. Served with cauliflower soup reheated in the microwave for 2 minutes. I put a beef roast in the oven at 350° with some pepper rubbed on the outside of it. Then I got to work on the soup. It has basically three ingredients plus whatever spices you might wish to add. I added a few threads of Persian Saffron. Soften the onions in the butter at a low-medium heat for about 10 minutes. Add the florets and 1.5 cups of flower and cover and continue cooking for about 20 minutes. After 20 minutes, stir and use the spoon to break down the florets into smaller pieces. Add the remaining 1.5 cups of water. If you want to add saffron, this is a good time. Cover and cook for 20 more minutes. Remove from heat and leave to cool.With olive oil, the soup will be slightly more tart than the soup made with butter. Turn the roast and let it cook some more. When the roast is done to 140° pull it out of the oven and let it rest for 10 minutes which is the perfect amount of time to puree the soup. Make sure it has cooled off some so you don’t burn yourself. This is the voice of experience. I don’t have a food processor or a blender, but I do have a Magic Bullet. You have to fill the Magic Bullet three times to whip it all up, but it will be lovely. Reheat to serve and, if you love nutmeg as much as I do, sprinkle a dash of nutmeg on top. 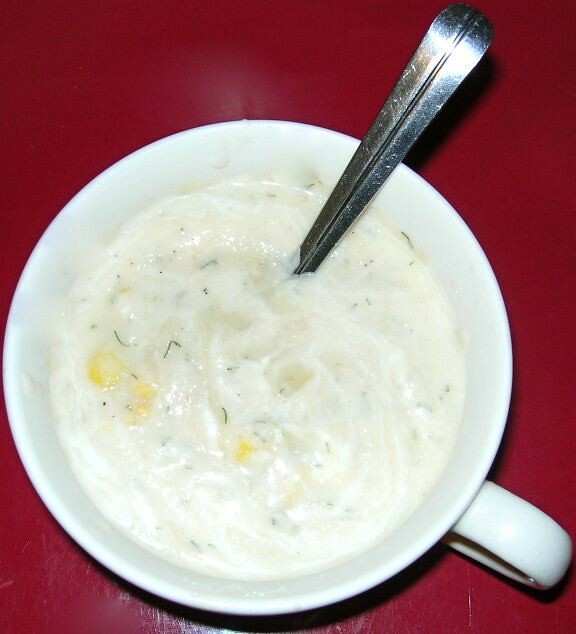 The soup will be light as air and smooth as silk. 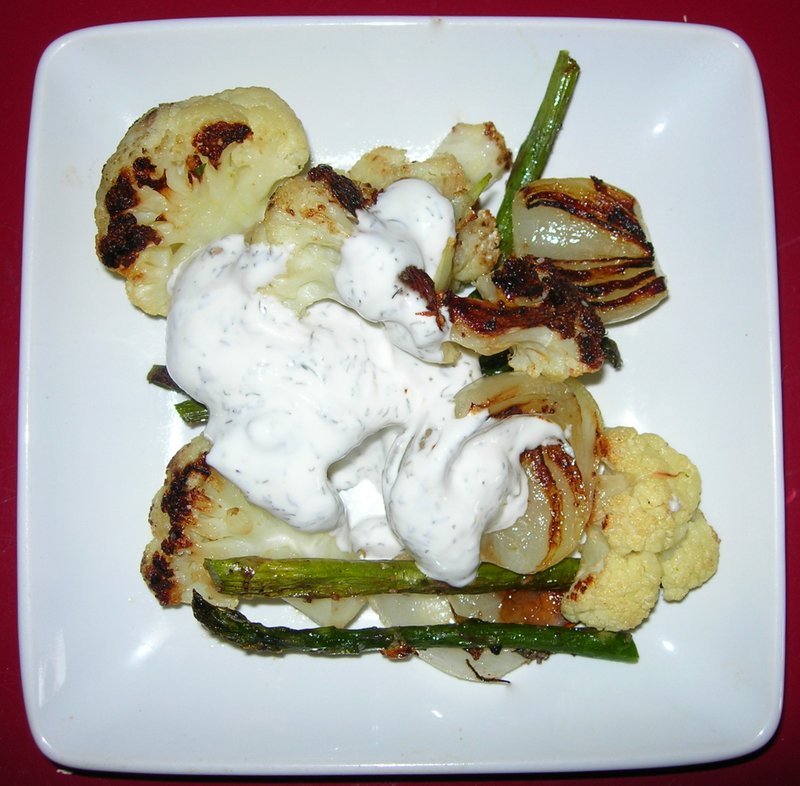 It will have a very subtle bite because cauliflower is such a strongly flavored vegetable if you treat it nicely. Slice up some roast and serve with the soup. 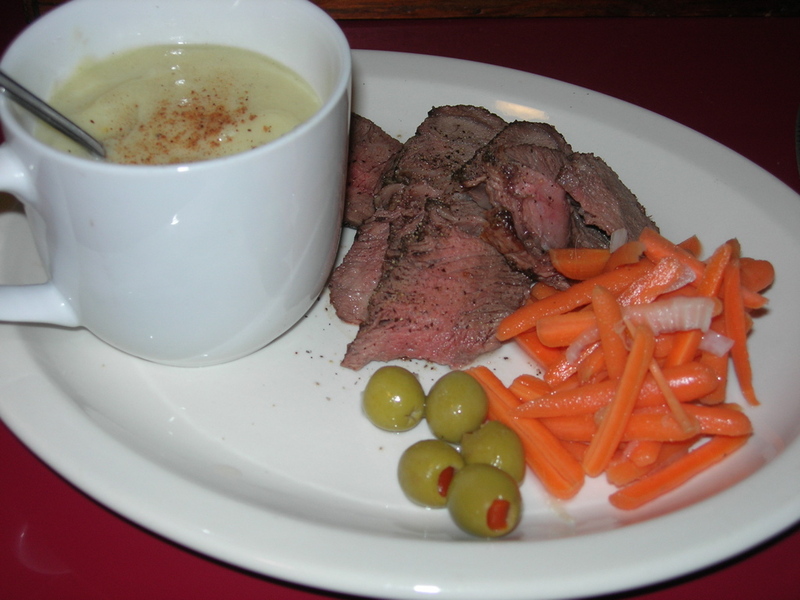 I added some olives and pickled carrots to give the meal some bright color. I recycled the vinegar dressing from my cucumber salad to make the carrots. The trick to successful vegetable medleys is understanding size and density. You are putting a bunch of different vegetables together and want them done at the same time. So you want to cut the denser, solid veggies like potatoes and parsnips and carrots to approximately the same size. 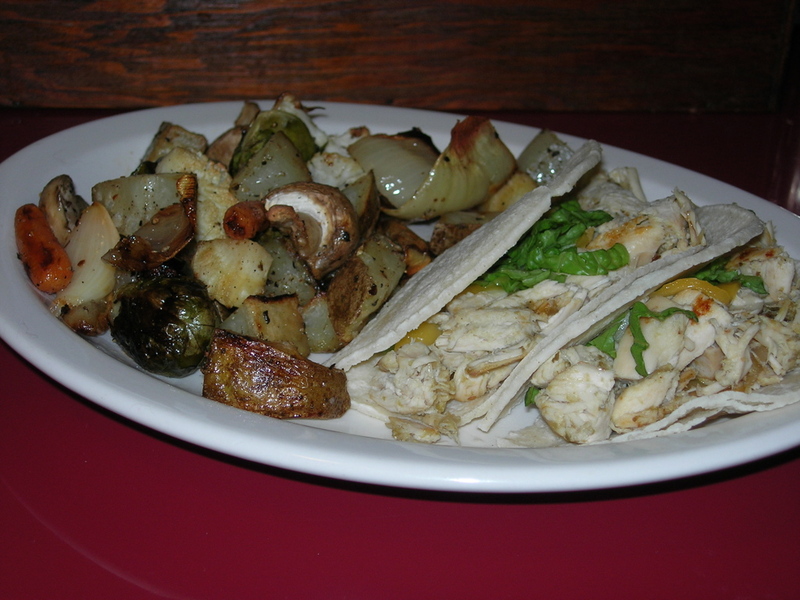 Softer veggies like Brussels Sprouts, onions, garlic and cauliflower can be cut a little smaller. Tender elements like mushrooms, olives and herbs can be added later. 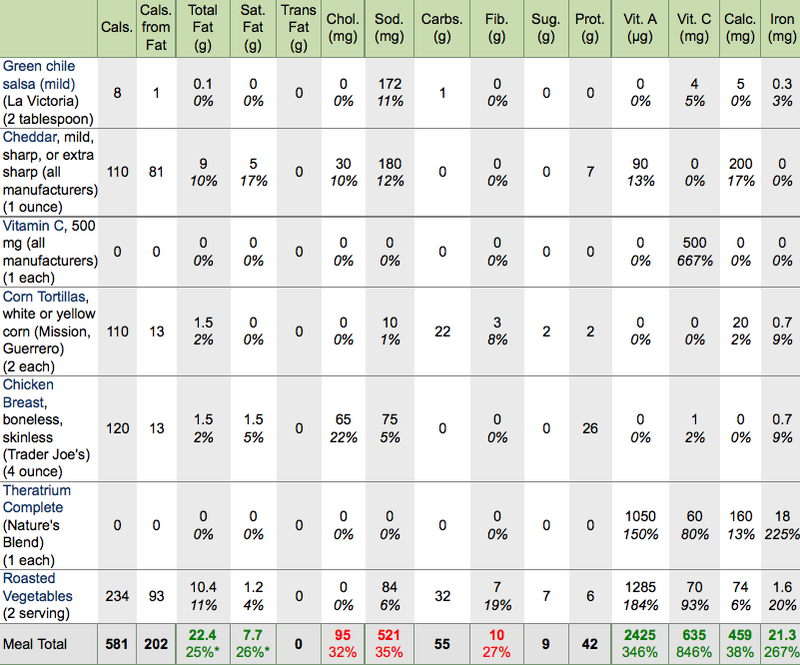 Sometimes you simply cannot make a single serving. Well, you could but it would be wasteful of cooking energy and vegetables. This recipe makes 6 servings. It reheats beautifully in the microwave. You also could reheat in a some broth for a quick vegetable soup with a nice smokey flavor. You can add to rice, pearl barley or pasta with a dash of melted butter, grated Parmesan cheese or a tablespoon of ranch dressing. You don’t have to bore yourself with leftovers. Just remix them. So, start by cutting up the tougher veggies and tossing them on a baking pan. I use my paella pan for roasting vegetables. Sprinkle them with a TBSP olive oil and a teaspoon of kosher salt. Bake at 450° F for 30 minutes. Remove from oven and add the tender veggies. Stir into the other veggies to get oil on them. You may have to sprinkle a teaspoon of olive oil on if it has been absorbed by the other veggies. Return to oven and bake for 20 more minutes, turning occasionally. Remove when browned. For the chicken tacos, I heated a half cup shredded chicken that I held back from the soup in 2 tbsp of green salsa. This way it gets the salsa flavor and I can reheat it without oil. I put it on a white corn soft tacos with some half a leaf of romaine shredded and a finely chopped or shredded slice of cheese. 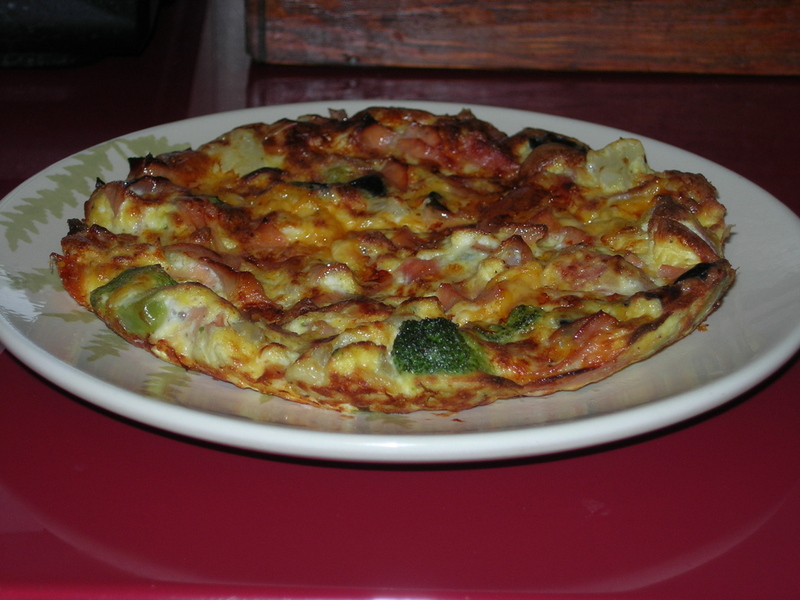 I was craving something hearty for breakfast so I decided to make a frittata. I turned the oven on to Broil. I diced 2 TBSP on onions, and thawed 1/4 cup of frozen winter vegetables, cutting the bigger pieces of broccoli and cauliflower in half. I sauteed this in 1 tsp of olive oil. I sliced 3 pieces of thin cut deli ham into small pieces and added to the mixtures. Meanwhile I hunted high and low for my can opener. Then I opened a small can of sliced black olives and put 1 TBSP in the veggie mix. In a small bowl I mixed up 2 eggs with 2 TBSP of water and 1 slice of cheddar cheese cut into small pieces. I added some salt, pepper and paprika and poured over the cooked ham and veggies. Using a spatula to turn up the edges and then rolling the pan to force the uncooked egg into the edges, I cooked on the burner until all the shiny gloss was gone and egg was fully cooked. I popped the eggs in the oven for 2 minutes or so to get a nice brown on top. 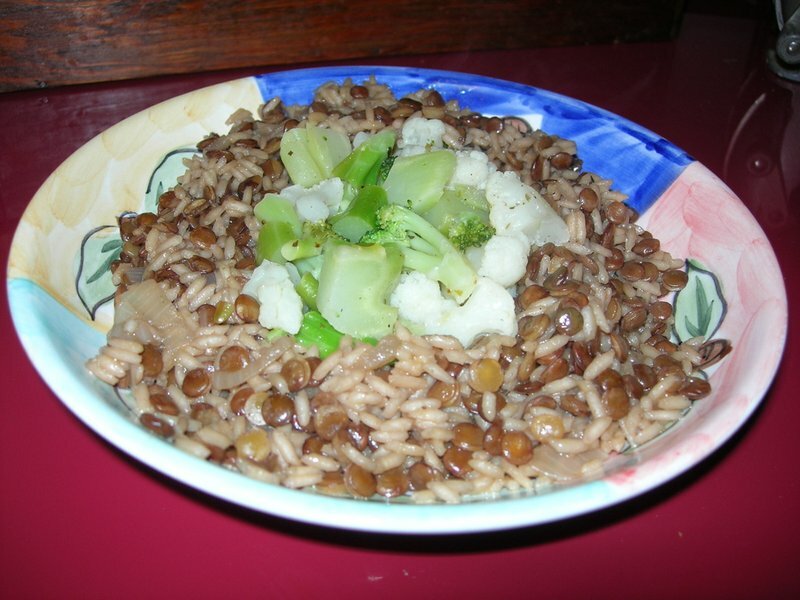 Mjadra is a favorite of mine – a Middle Eastern casserole of lentils and rice. To make it, chop up 1/4 of an onion and crush one onion. Add to 1 TBSP of olive oil and cook until caramelized. Add 1 teaspoon of cumin and stir in with some salt and pepper. Add 1 can of vegetable broth and 1/2 cup of lentils. Bring to a boil and simmer for 20 minutes. Add 1/2 cup of rice. The water will begin boiling again quickly. Put a lid on the pan and turn off the heat. In 15 minutes it will be done. This makes enough for two to three meals, but I am not going to save a partial can of broth. Meanwhile, put 1.5 TBSP of Girard’s Greek Feta Vinaigrette in a sauce pan. 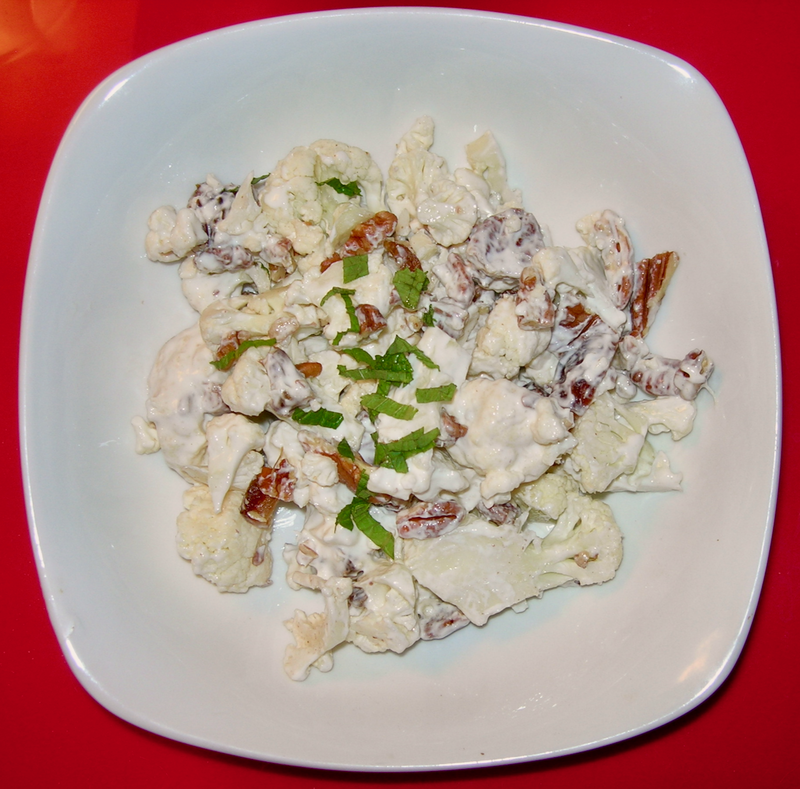 Add 1 cup of frozen cauliflower/broccoli mix or fresh if you have it. Simmer slowly so you don’t need to add more vinaigrette. It is tasty without even adding salt and pepper.